Note: this post was originally published on Friday morning. It has since been updated with additional images and a summary of the Design Commission’s comments. 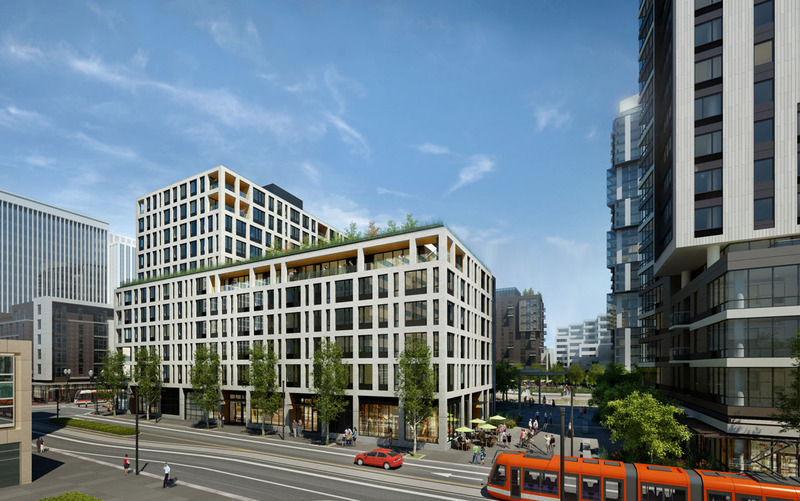 Oregon Square, the massive superblock development by American Assets Trust, GBD Architects and Place Studio landscape architects, has gone before the Design Commission for its first full Design Review hearing. 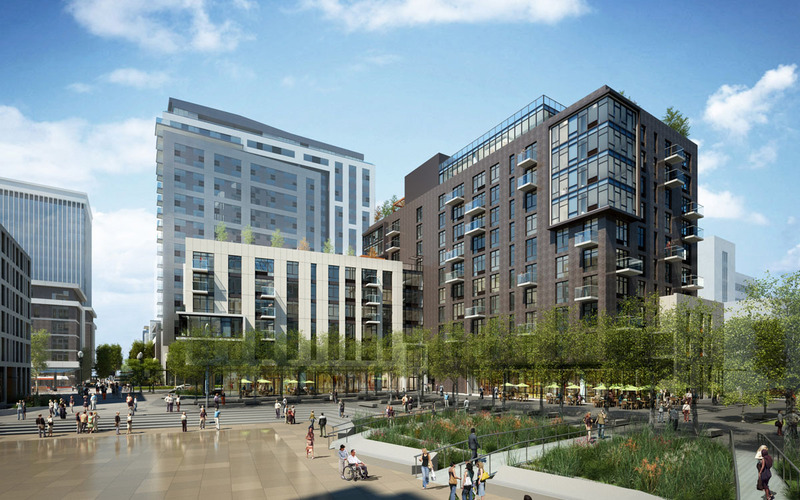 The Lloyd District project will include 940 residential units and 50,000 sq ft of retail, with a new public plaza at its center. 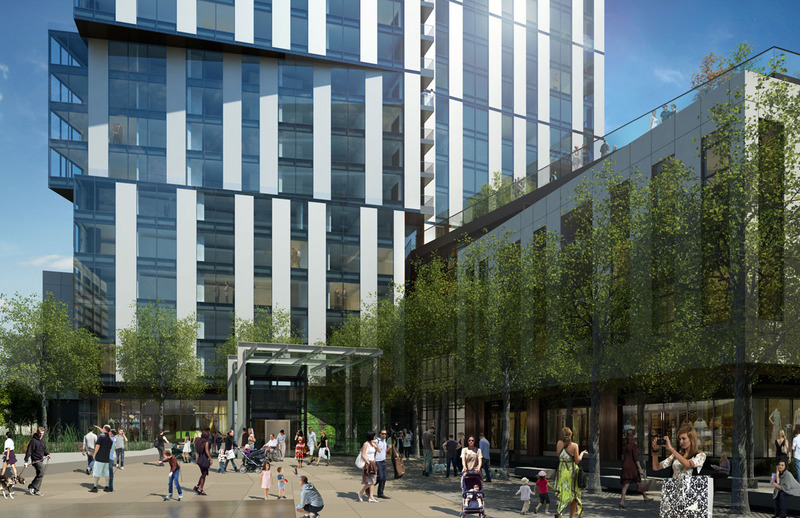 Surrounding the plaza will be four buildings, varying in height from 11 to 30 floors. 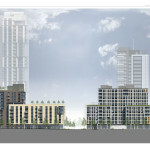 At a maximum height of 343′-6″ Block 103 of Oregon Square will be the tallest building in the city east of the Willamette. 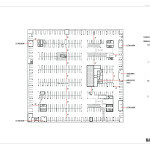 908 below grade parking stalls will be provided in a below grade parking structure. Almost 1,500 bike parking spaces will be provided for the use of residents, visitors and employees. 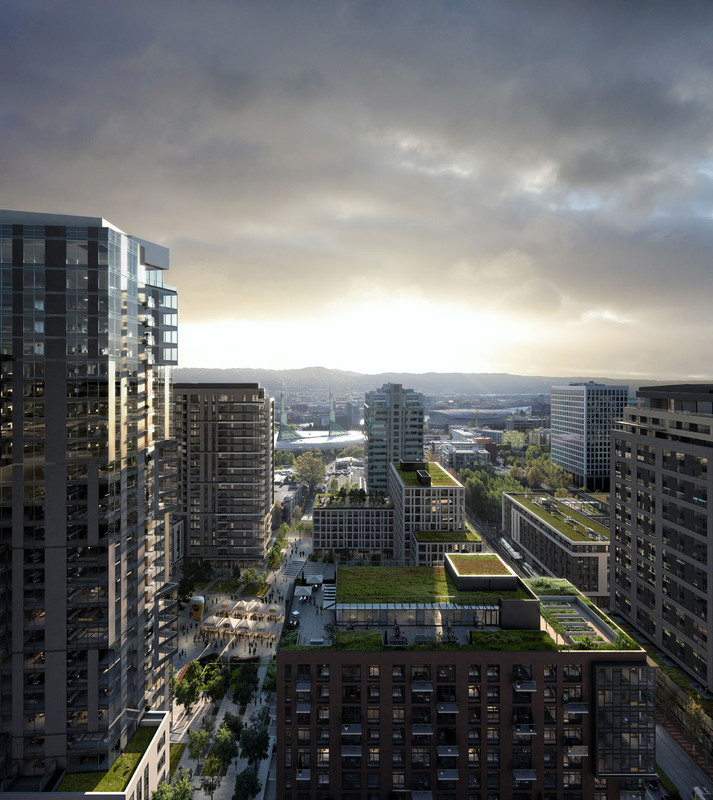 The development is the second phase in the redevelopment of American Assets Trust’s Lloyd District properties. The first phase, Hassalo on Eighth, is nearing completion immediately the north. 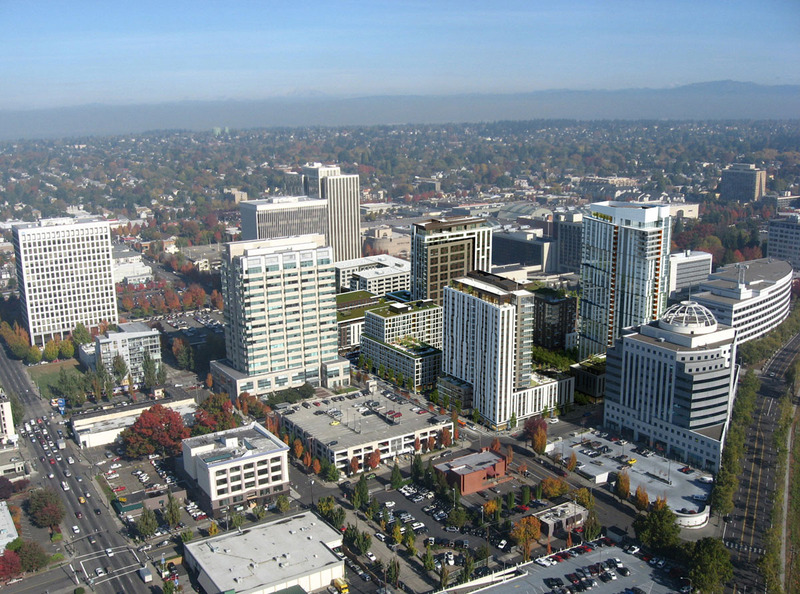 The Oregon Square site is a superblock bound by NE 7th Ave, NE Holladay St, NE 9th Ave and NE Oregon St. It is currently developed with four low rise office buildings, built by the Lloyd Corporation between 1939 and 1950. None are listed on the National Register of Historic Places, though all four have been identified as eligible for inclusion. 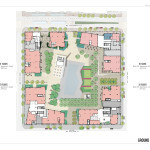 The four proposed buildings all have L-shaped plans at their podiums, which will wrap around the central square. 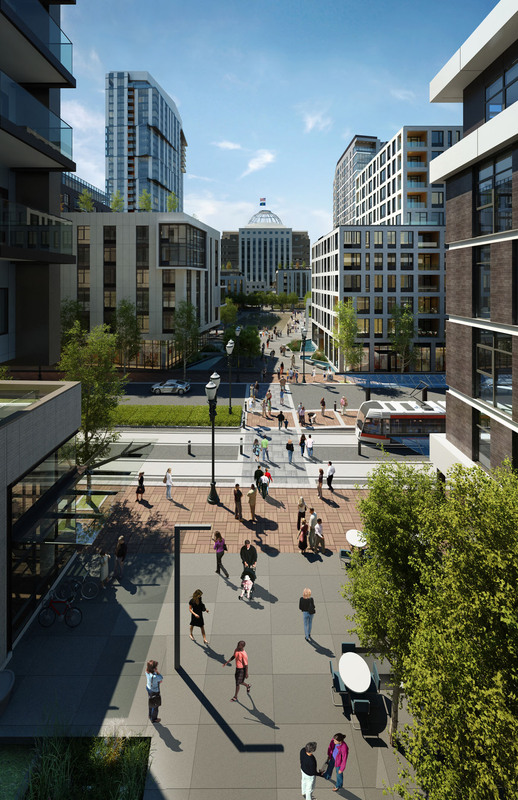 In the north-south axis the square will act as the terminus to the reinstated NE 8th Ave, a pedestrian only street running through the center of the American Assets Trust properties. In the east-west direction the plaza aligns with NE Pacific Ave, which leads to the main entrance of the Oregon Convention Center. 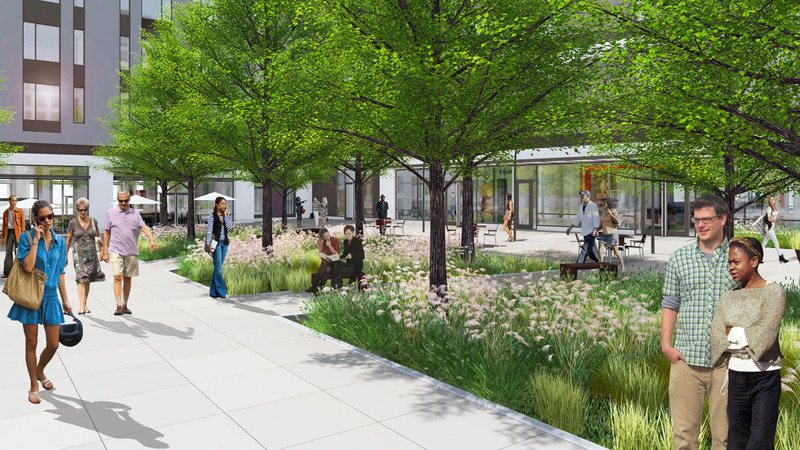 The 300′ x 300′ square will include a large water feature, trees, storm and waste-water treatment planting, as well as a stair and elevator pavilion that connects to the underground parking. 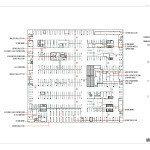 The retail lining the square will be double sided, with frontages to both the surrounding streets and the square. 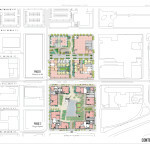 The designers imagine that the square could be used for performances, public events or the Lloyd Farmers market, which is currently held on the site on Tuesday mornings. 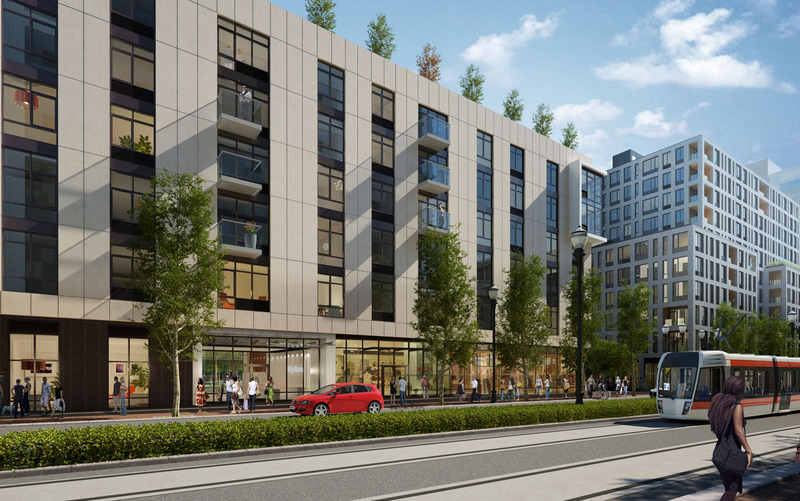 Proposed for the northwest corner of the development, across the street from the recently completed Velomor, is Block 91. 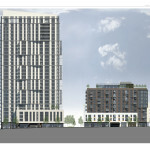 The 11 story building 160 residential units. The primary exterior material for the building would be smooth white brick with a running bond coursing. 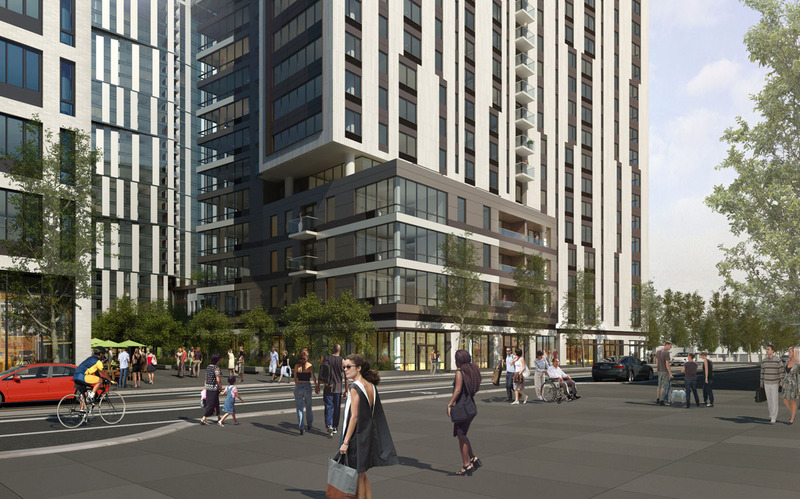 At the north east corner of Oregon Square will be Block 102, located directly across the street from the under construction Aster Tower. 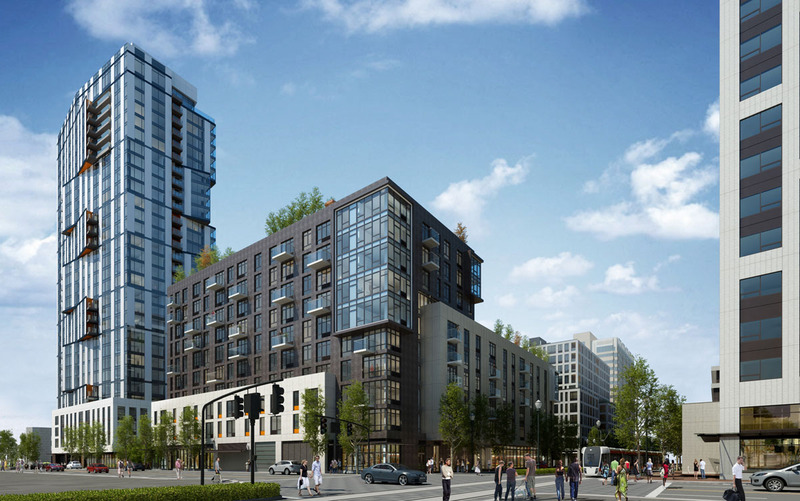 The building would include 163 residential units. 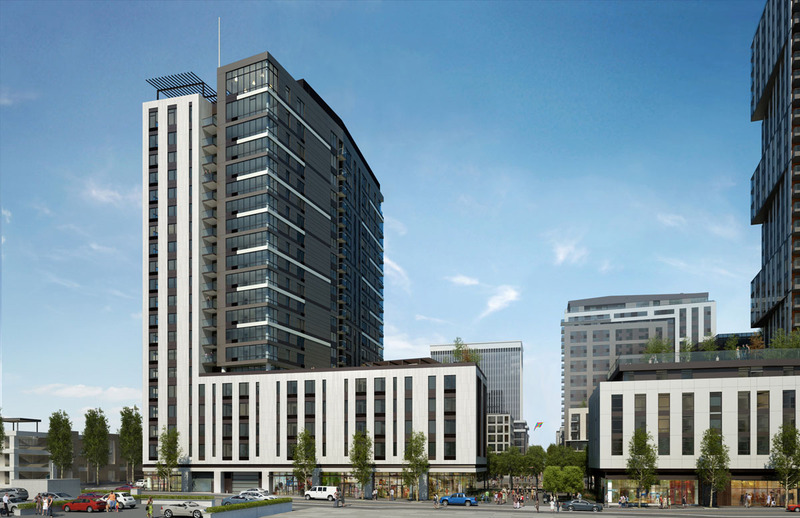 Also 11 stories, the building materials include dark brick with stack bond coursing, honed white precast concrete and smooth beige glass fiber reinforced concrete panels. 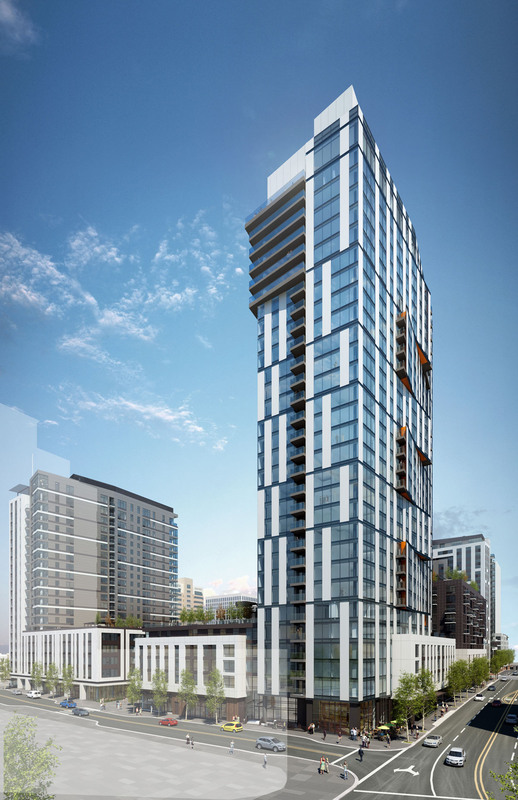 The tallest building proposed at Oregon Square is Block 103, located at the south east corner. 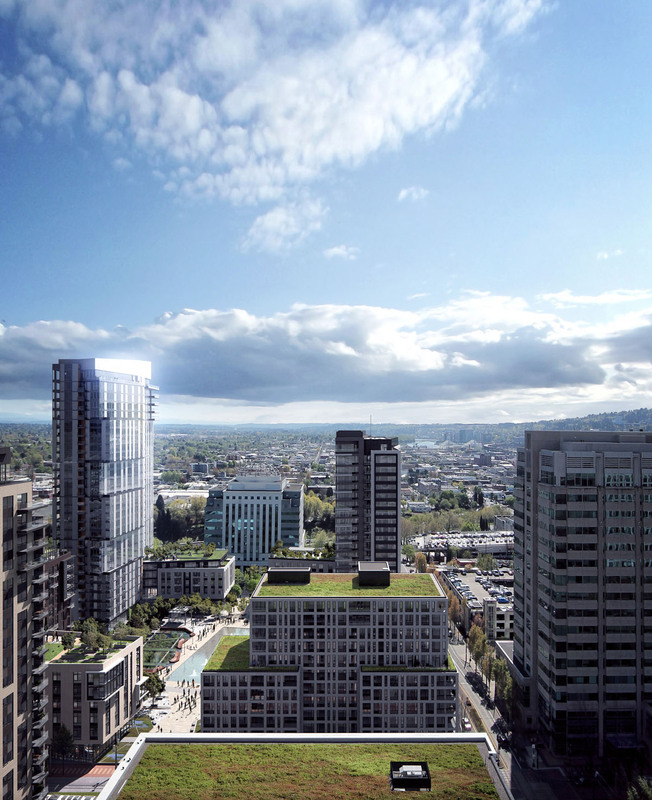 The building would include 347 residential units in a 30 story tower. The primary material proposed for the tower is a glass curtainwall system, with white metal panels. 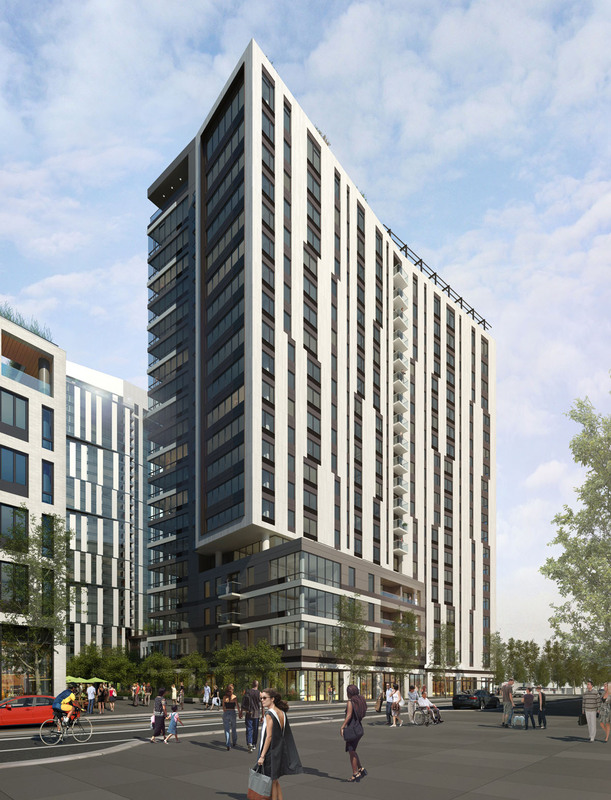 Honed white precast concrete is proposed for the podium element of the tower. 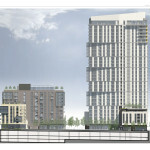 The second tallest tower is proposed for the southwest corner of the development. 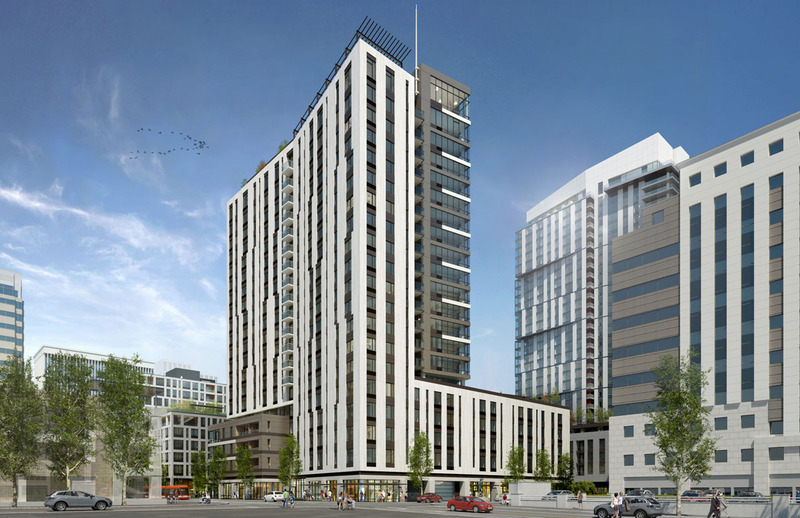 Block 90 will include 274 units in a 21 story building. 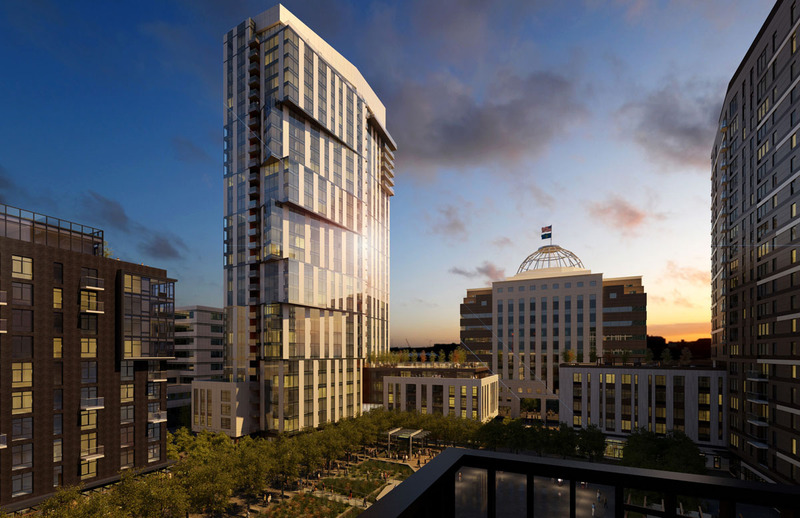 Materials proposed include white glass fiber reinforced concrete panels, metal panels in white and two shades of bronze, as well as white honed precast concrete panels. 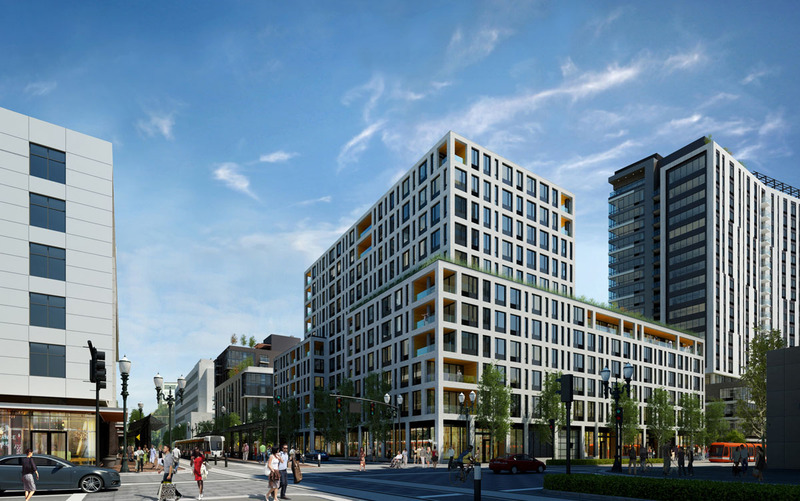 A Staff Report and Recommendation to the Design Commission [PDF], published before the hearing, did not yet recommend approval for Oregon Square. 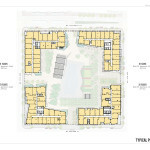 Concerns raised by the Bureau of Development Services staff included the potential visibility of mechanical screening at the top of Block 103; the overall design coherency of Block 90; and the need for differentiation and variety in the transition areas of the square. At the hearing the Commissioners were in strong support of the overall project, and any lingering doubts from the three prior Design Advice hearings about whether the square would work were no longer present. 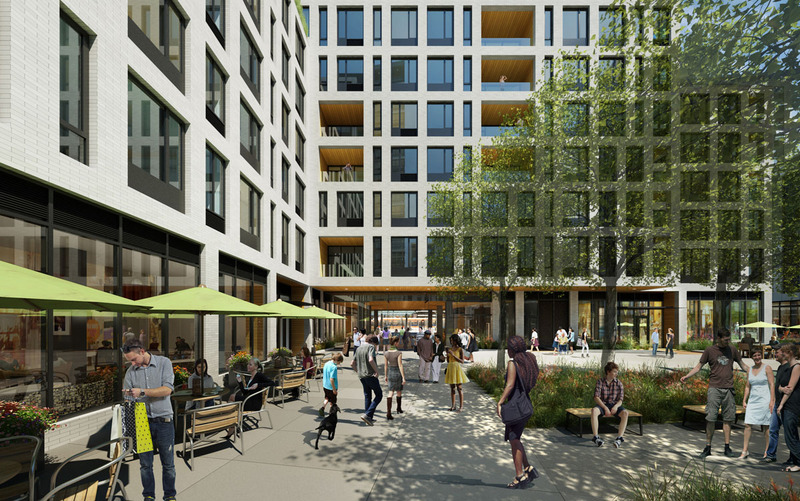 Commissioner Kaiser was extremely pleased that one of the largest projects in the City’s history, by an outside developer, will be LEED Platinum. The Commission praised Place Studio for the way they had divided a huge space into a variety of smaller spaces, which will allow a range of activities to take place. 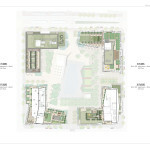 They appreciated the way that the landscaping emphasizes the need to draw people in from the north and west. 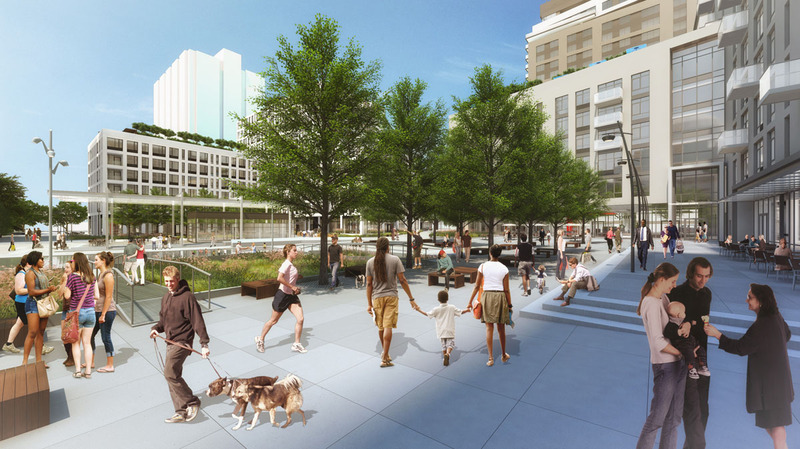 Commissioner Livingston described the landscape design as “lovely” and “light hearted”. Commissioner Savinar expressed disappointment that they had not yet engaged an artist for a potential of public art, and cautioned that the precedent images the applicants showed in the Design Review packet would be far beyond the budget they have allocated for art. 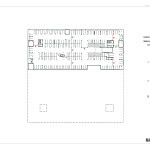 There was an extended conversation about whether it is preferable for people to exit the parking garage in a pavilion structure (as at Director Park, or Hassalo on Eighth), or at the ground floor of one of the building (as at the Brewery Blocks). 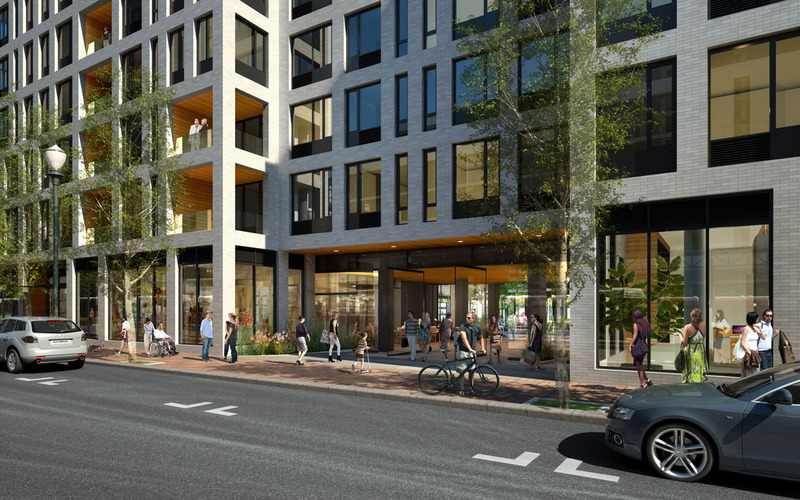 There was unanimous and enthusiastic support for Block 91, which Commission Chair David Wark described as the best building he has seen GBD bring before the Design Commission in his time sitting on the body. As proposed the building has a pass through lobby at the ground floor, open to the public, which received a mixed response. 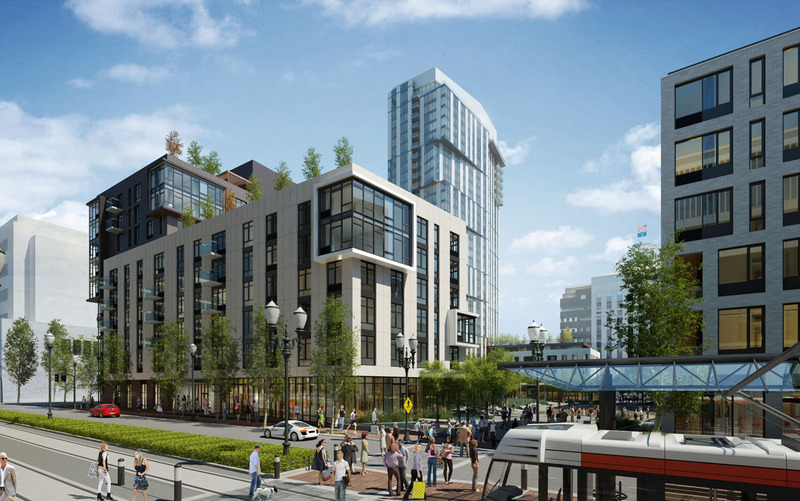 Some Commissioners welcomed the fact that it will create a shortcut into the square from the MAX stop, while others were worried it would draw activity away from the main portals into the square. 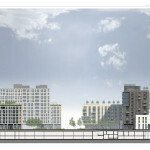 Block 102 was less well received, with all five Commissioners present expressing a desire for the architects to take another pass at the design. While the massing was seen as appropriate, there was a strong direction given to make the elevations less complex. 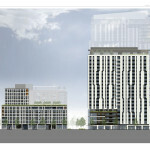 The architects were advised to take the same rigor they had applied to Block 91 and apply it to Block 102. 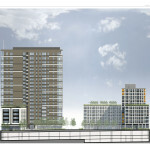 Though the staff report expressed concerns about Block 90, the Commission was more receptive to its design. During the comments about the square earlier in the hearing, it was noted that it was unfortunate that Block 90 will cast shadows onto the square in the mid afternoon. 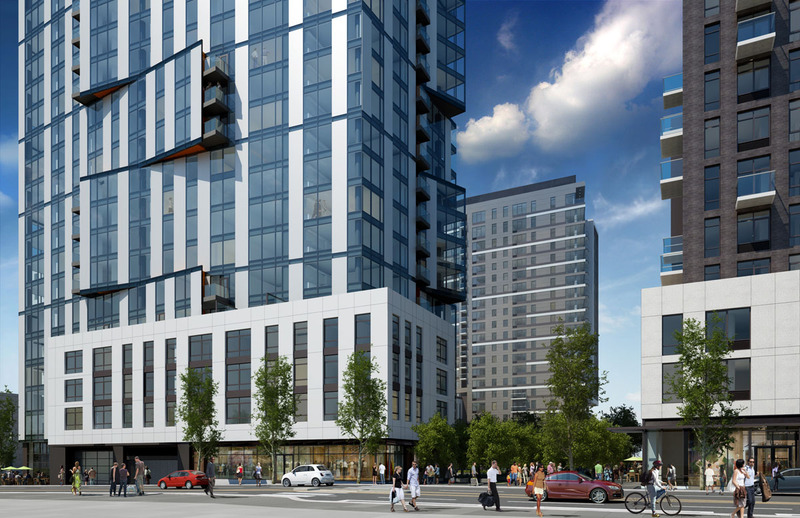 The architects explained that the spacing of the towers in the project was based on the existing ~400′ separation found in the district. As noted by Commissioner Livingston this makes a lot of sense from an urban design point of view, but is unfortunate when considering how the sun moves through the sky. 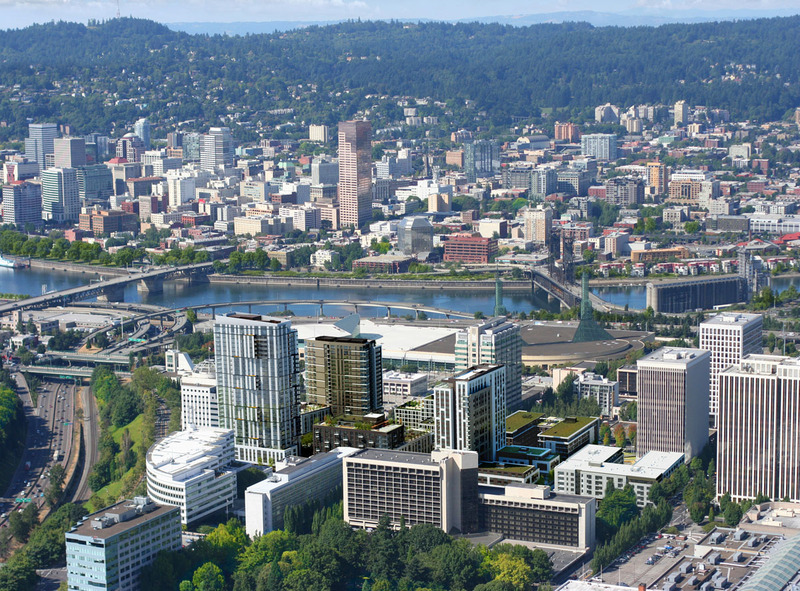 Commission Kaiser suggested removing some height from the tower and adding it to Block 91 or 102. 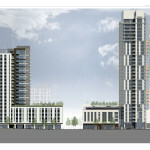 The last building discussed was Block 103, the tallest of the four buildings. The body of the tower drew strong praise, with Commission Savinar describing himself as being “really excited” about the building. He complimented the pleats on the facade, though noted they were more successful on the east elevation than the west elevation. 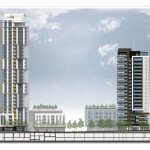 The Commission felt that the ground floor of the tower felt “compressed”, and said that they would be willing to allow a small amount of additional height if it improved the ground floor by making it more generous. 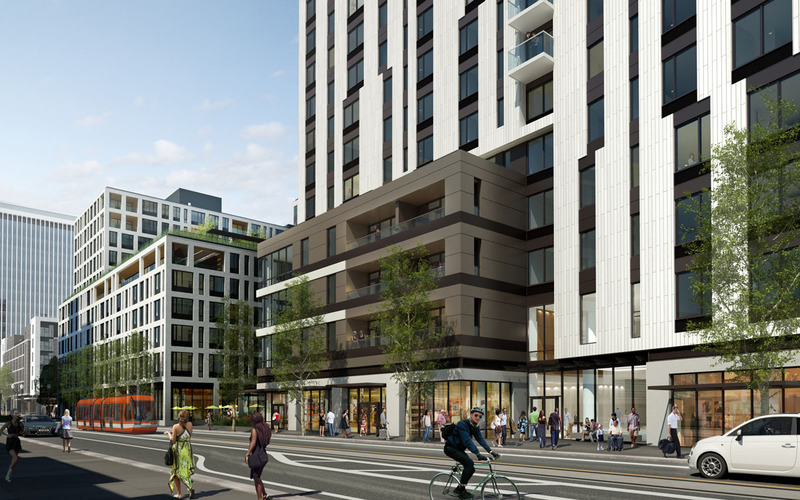 Commissioner Wark, in a comment that applied to both the Block 103 podium and the Oregon Square project as a whole, expressed a desire for some continued work at tidying up the elevations. 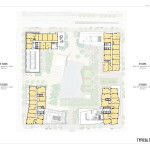 While noting that there is nothing wrong with each building having its own design, he said that there was a need for each one to be simplified. The project will now return for a second Design Review hearing on October 1st.